Explanation: What was happening in the sky during last week's total solar eclipse? 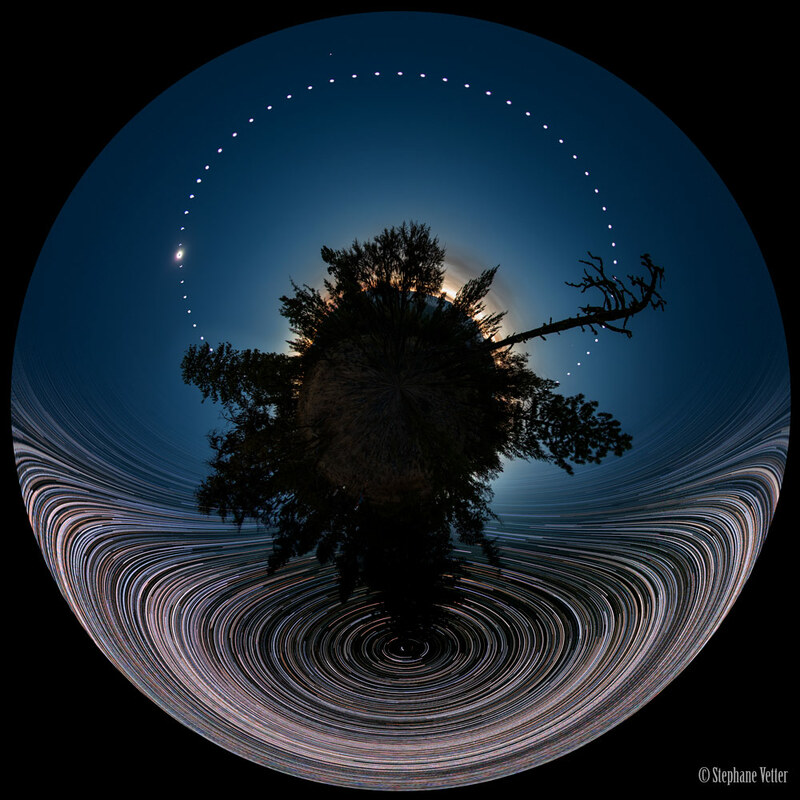 This featured little-planet, all-sky, double time-lapse, digitally-fused composite captured celestial action during both night and day from a single location. In this 360x180 panorama, north and south are at the image bottom and top, while east and west are at the left and right edges, respectively. During four hours the night before the eclipse, star trails were captured circling the north celestial pole (bottom) as the Earth spun. During the day of the total eclipse, the Sun was captured every fifteen minutes from sunrise to sunset (top), sometimes in partial eclipse. All of these images were then digitally merged onto a single image taken exactly during the total solar eclipse. Then, the Sun's bright corona could be seen flaring around the dark new Moon (upper left), while Venus simultaneously became easily visible (top). The tree in the middle, below the camera, is a Douglas fir. The images were taken with care and planning at Magone Lake in Oregon, USA. Total Eclipse 2017: More memorable images -- please "Like" your favorites.